Every Saturday, I head down to the farmer's market to pick up some fresh produce and my favourite Mediterranean bread. This bread is full of Italian seasonings and olives and sends a warming herbaceous scent through the house when I toast it up each morning for breakfast. When I get it home from the market, I immediately slice it, divide it up into pairs, bag it, and freeze it. That way, it's ready to be quickly tossed into the toaster each morning and lasts all week (well, that is unless Scott decides he's going to indulge). Unfortunately, this week I was forsaken by my favourite baker when I showed up in the bitter cold to find out that the last of the Mediterranean bread was gone. Alas, what was a poor, breadless girl to do? Well, the only thing she could do, roll up her sleeves and bake her own - the travesty! 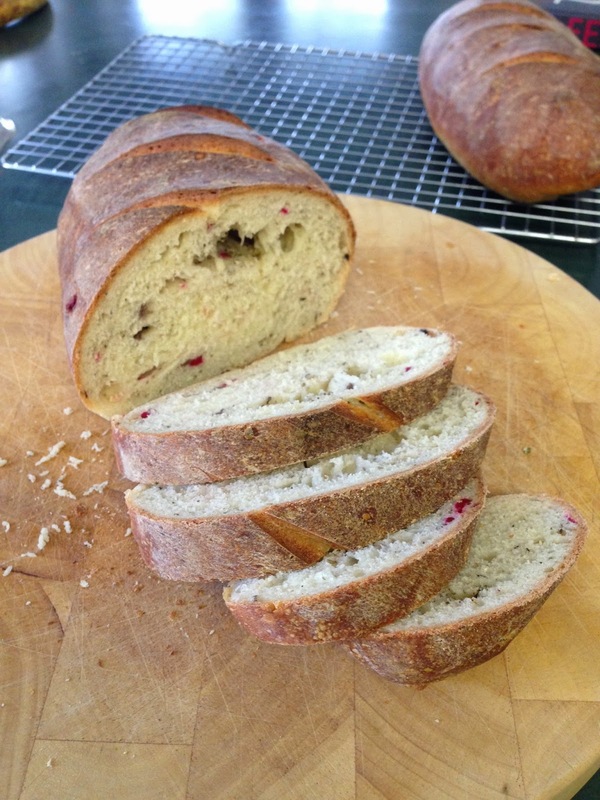 This recipe is adapted from one by the bread god Peter Reinhart. The dough is super easy to make, does not require a huge commitment, can be stored in the fridge for up to four days before baking, and produces two bakery-quality loaves. 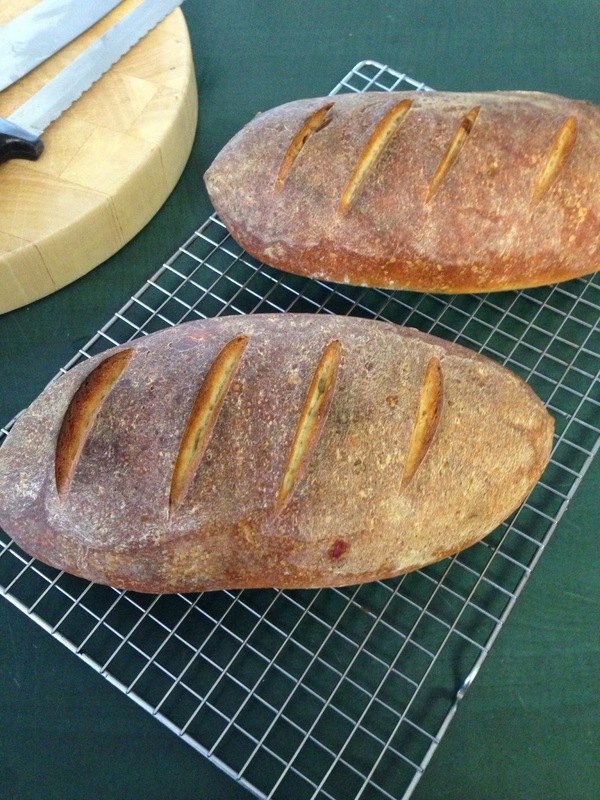 If you've never baked your own bread before, now is the time to try. If you just want a regular white French loaf, omit the herbs and olives. This can also be made into buns, but will require less cooking time. Before you begin, read through all the directions. It looks as though there are many steps, but it is actually quite simple. 1. Mix the flour, salt, yeast, and spices together in a bowl. Add 2 cups of the water and stir with a spoon. Continue to add up to a half cup more water until the dough has formed a shaggy ball that is tacky but not sticky. Stir for one minute. Cover with plastic wrap and let rest for 5 minutes. 2. 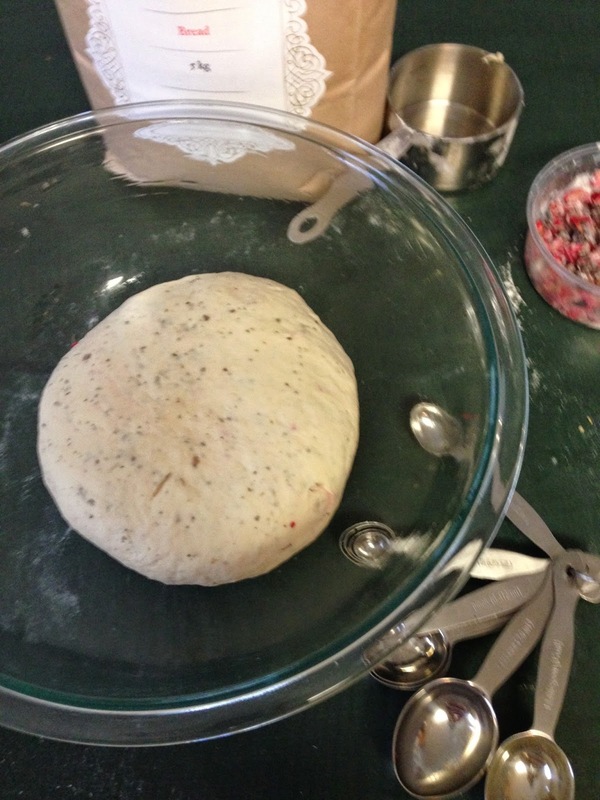 Take the dough out of the bowl, place on a lightly floured surface, and knead for 3 minutes. While you are kneading, work the olives into the dough by adding them to the middle, folding the dough over to cover them, and kneading more. Add more flour if necessary, but keep it tacky. Do not over flour. 3. Form the dough into a ball and place it back into the bowl, which has been lightly oiled. 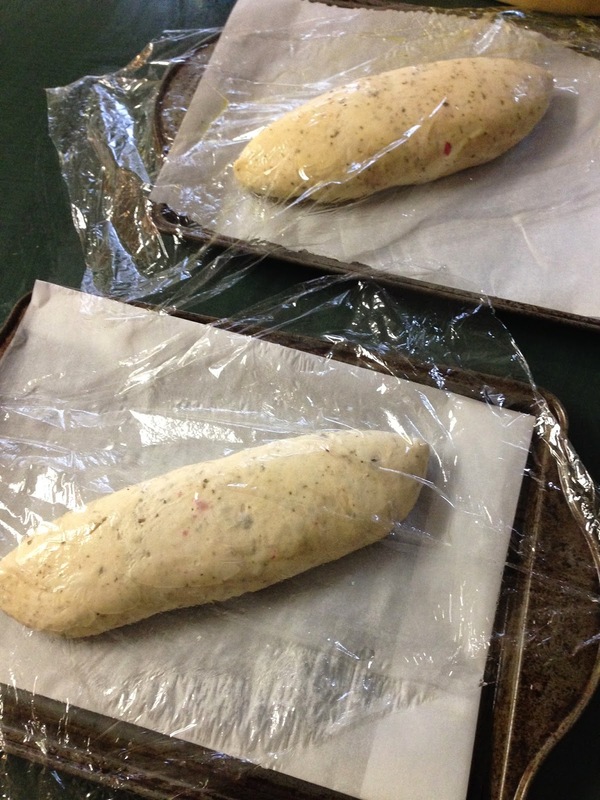 Cover with lightly oiled plastic wrap and refrigerate overnight or up to 4 days. 1. Remove the dough from the fridge at least 2 hours before you want to bake it. Gently divide it in half being careful not to burst the air pockets that have formed inside the ball. Turn each half over, fold the top and bottom towards the middle of the ball and pinch the seam closed. Turn it back over and place on a parchment-lined baking sheet. Cover with the lightly oiled plastic wrap. Let rise until it is 1 1/2 times its original size. 2. Place one of the oven racks on the very lowest shelf and the other one on the middle shelf. On the lower rack, place a metal tray or lasagne pan. Preheat the oven to 500 degrees Fahrenheit. 3. 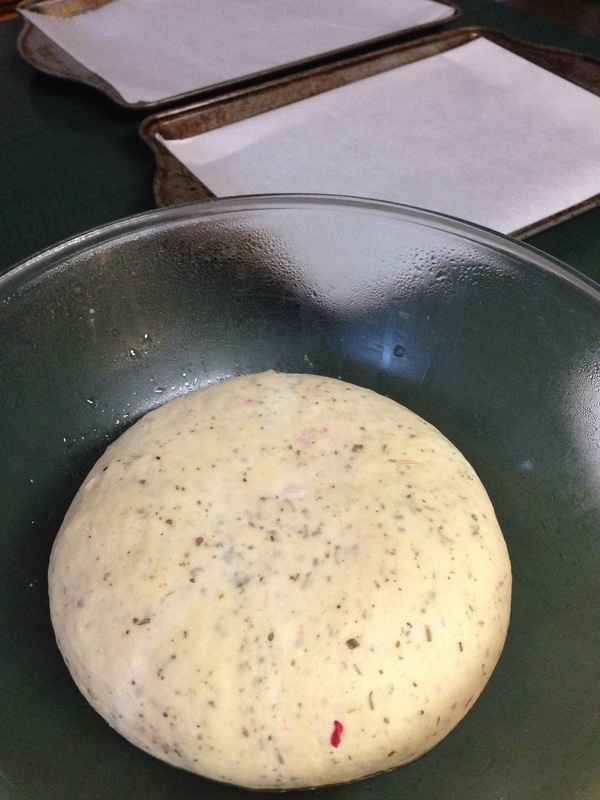 Fifteen minutes before you want to bake, remove the plastic wrap from the dough. 4. Immediately before baking, pour one cup of water in the tray in the oven, and gently make four slashes on each loaf with a bread knife. Place the loaves on the middle rack. 5. As soon as the loaves are in the oven, turn the temperature down to 450 degrees Fahrenheit. 6. After 15 minutes, turn and rotate the pans and bake for approximately 12-15 more minutes. You will know when the bread is done because it will sound hollow when you tap the bottom of it. 7. Immediately remove the bread from the baking tray and place on a cooling rack for at least an hour before slicing. 8. The bread will keep for about a day if wrapped in a kitchen towel, but as mentioned above, I prefer to slice and freeze it for maximum freshness. (This way you also don't feel tempted to inhale an entire loaf of bread in 24 hours!). Enjoy! 1. It is important for yeast breads to use bread flour and not all purpose flour. The percentage of gluten is higher, which results in a higher rise. 2. 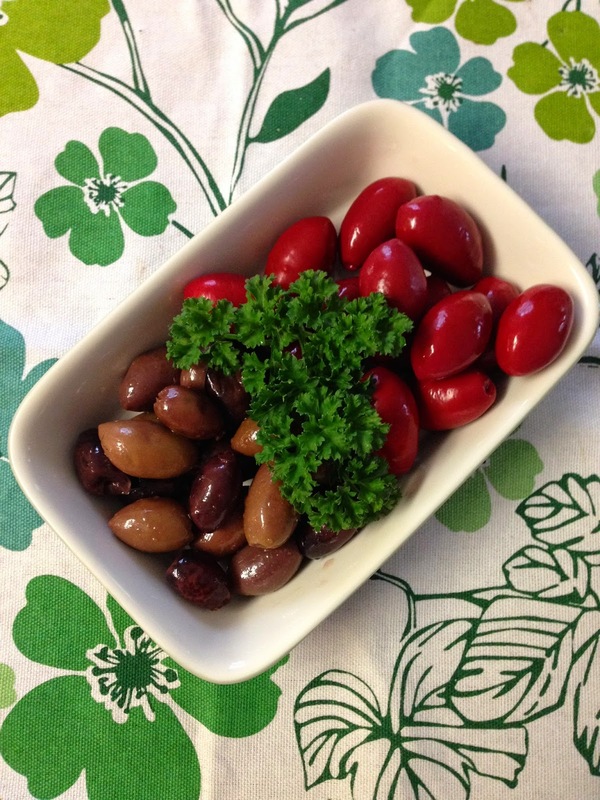 Select a combination of olives that taste good to you. I chose Kalamata and pink olives, which are both quite fruity, but my favourite baker uses a mixture of green and black. If they don't taste good before you bake them, they certainly aren't going to taste good after you bake them. Save yourself the headache, and buy olives that are already pitted. If for some reason you don't, simply smash each one with the side of your knife to remove the pit with your fingers before chopping them.